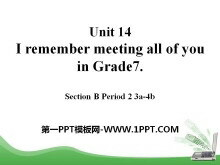 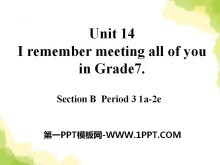 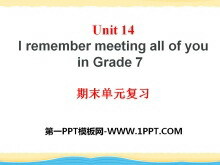 《I remember meeting all of you in Grade 7》PPT课件13 Revision Translate the phrases. 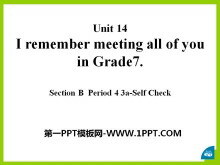 ?#38405;?#20154;心存感激 be thankful to sb 连同 along with 对......有责任 be responsible for 渴求，渴望 be thirsty for （时间）过去 go..
《We're trying to save the earth!》PPT课件11 Revision 1. 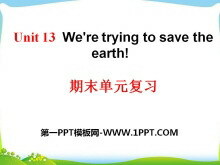 停止乘小汽车 stop riding in cars 2. 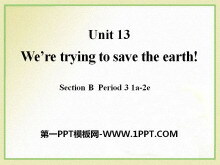 回收纸 recycle paper 3. 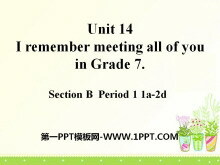 用纸巾 use paper napkins 4. 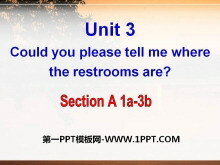 ?#29028;美?#29992; put to good use 5. 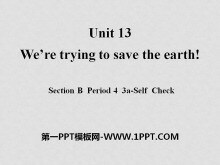 ?#32654;?#22334;建造房子 build a house out of r..